This is Part V of a comprehensive multi-part article series with in-depth measurements and analysis for the OLED and LCD displays on the Google Nexus One, the Apple iPhone 3GS and the Motorola Droid. It is produced as a collaboration between DisplayBlog and DisplayMate Technologies. We will show you the good, the bad, and also the ugly unfinished rough edges and problems lurking below the surface of each of these displays and display technologies. Each article will be introduced and discussed on DisplayBlog by Jin Kim, followed up with a detailed technical analysis and measurement data on the DisplayMate website. Part I deals with the Google Nexus One, Part II with the Apple iPhone 3GS, and Part III is a detailed point-for-point Shoot-Out comparison between the displays on Nexus One and the iPhone. Part IV deals with the Motorola Droid and Part V is a detailed point-for-point Shoot-Out comparison between the displays on the Nexus One and the Motorola Droid. There have been lots of articles and discussions comparing the iPhone, Nexus One and Motorola Droid displays, but no one has yet done anything more than superficial eye ball commentary. This article series is an in-depth scientific analysis of these displays. The Nexus One display is distinctive and unusual in several respects: it is an Organic LED display, which is an emissive display technology, whereas most mobile devices have an LCD display, which uses a static backlight behind the panel. The screen is 3.7 inches diagonally and has a high-resolution high-density 800x480 pixel display with a screen Aspect Ratio of 1.67. The Motorola Droid has a traditional LCD display with a White LED backlight. The screen is 3.7 inches diagonally and has a high-resolution high-density 854x480 pixel display with a screen Aspect Ratio of 1.78, which is identical to standard 16:9 widescreen displays, such as HDTVs, which have an Aspect Ratio of 1.78. Both phones use the Google Android OS. The Nexus One was tested with version 2.1 and the Motorola Droid with version 2.0.1. We found so many image and picture quality problems and implementation issues with the display on the Nexus One that it will be especially interesting to see whether the Motorola Droid, which has the same Android OS, suffers from the same problems and issues, or whether Motorola did a better job of engineering the display hardware, firmware and software than Google and HTC. Click Here to Compare Before and After Upgrade Images. Google acknowledges these problems for all 2.1 Android phones including the Nexus One and Motorola Droid. The next major release of the Android OS will fix these issues and provide full 24-bit color and improved scaling. Click Here to Read the Google and Cooliris Statements. First we provide a summary of the Graphical Data from Part I and Part IV, next a comprehensive point-for-point color coded Comparison Table, and then finish with Suggestions and Conclusions for Google and Motorola. Below is the Graphical Data for the Nexus One and Motorola Droid from Parts I and IV. For details, measurements, explanations and in-depth analysis see Part I devoted to the Google Nexus One and Part IV devoted to the Motorola Droid. 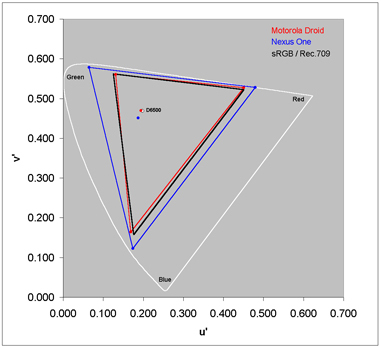 Figure 1 shows the Color Gamuts and White Points with the sRGB / Rec.709 Standard for computer images, photos and video. 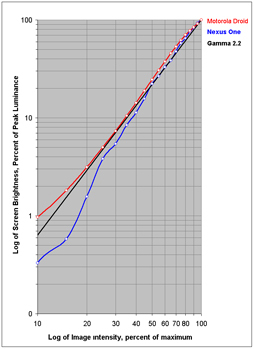 Figure 2 shows the Intensity Scales for the Nexus One and Motorola Droid and a Standard Gamma of 2.2. 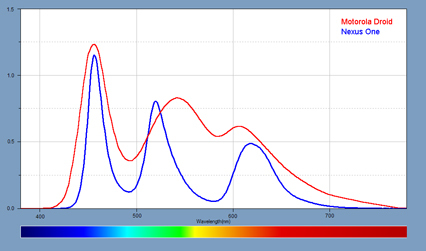 Figure 3 shows the light spectra for the Nexus One and Motorola Droid. Below we compare the data on the Nexus One and Motorola Droid from Parts I and IV. Note that we are testing and evaluating the displays on the Nexus One and Droid with whatever hardware, firmware, OS and software are provided by Google and HTC for the Nexus One and Motorola for the Droid. to a calibrated studio monitor. because of the typically high ambient light. Below are the suggestions and conclusions for the Nexus One and Motorola Droid from Parts I and IV. DisplayMate Technologies specializes in advanced mathematical display optimizations and precision quantitative and analytical scientific display factory calibrations to deliver outstanding image and picture quality and accuracy while increasing the effective visual Contrast Ratio of the panel and producing a higher calibrated brightness than is achievable with traditional calibration methods. We can also make lower cost displays look almost as good as more expensive higher performance panels. These articles are a brief introductory critical analysis. Our optimizations correct these deficiencies and much more. If you are a display or product manufacturer and want to turn a standard panel into a spectacular one Contact DisplayMate Technologies to learn more. 1. Eliminate the primitive 16-bit display interface and fix the Browser, Gallery and other applications. 2. The White Point is too blue, lower it to D6500, which will improve color accuracy, slow the aging of the Blue OLED, reduce power consumption, and improve battery run time. 3. Improve the factory display calibration to correct the large color and gray-scale tracking errors and the irregular and non-standard display contrast and Gamma. 4. The color saturation of the display is way too high. You can trade this excess color saturation to boost the screen brightness by adjusting the software color calibration matrices. This will also improve the color accuracy of the display. 5. Take full advantage of the OLED display: the ambient light sensor now just controls the screen brightness. You should also use it to control the gamma, color gamut, color saturation, and edge enhancement so that in low ambient light the display delivers beautiful and accurate image and picture quality, but as the ambient light increases slowly turn up these parameters to counter-balance the washed out appearance of the images in bright ambient light. Also add a display Vivid or Pizzazz control because some people prefer punchy images and pictures, while other people do not. Keep up the good work… To make your displays even better follow the detailed comments and recommendations above and in greater detail in Part IV. Also ask Google to fix the poor image rescaling and its 16-bit implementation in the Browser and possibly other Android OS applications. The Nexus One OLED display has many spectacular qualities, but it is also loaded with lots of rough edges, hasty unfinished beta display drivers and Android software including principal applications like the Browser and Gallery, poorly implemented image processing, poor system integration together with sub-standard factory display calibration. It really looks and behaves like a prototype for a very nice future display, not a finished production display for a world class mobile device that Google markets it to be. It will be interesting to see the degree to which existing units will be corrected and improved with software updates. The Motorola Droid is an excellent mobile display with just a few comparatively minor shortcomings. In terms of image and picture quality it comes closer to a high quality computer monitor or HDTV than any other mobile display we have tested – all the more impressive because mobile displays operate under challenging size, power and cost constraints. In fact, the image and picture quality and accuracy on the Droid is actually better than in most computer monitors and HDTVs (but smaller, of course). The screen is very bright and very sharp, has excellent color and gray scale accuracy, and has very good Contrast and readability under both dim and bright ambient light. For these reasons we have awarded the Motorola Droid the DisplayMate Best Video Hardware Guide Award for both Smartphones and the entire Mobile Display category. Read Part I devoted to the Google Nexus One and Part IV devoted to the Motorola Droid. Part II is devoted to the Apple iPhone 3GS. Special Thanks to Jay Catral of Konica Minolta for visiting the DisplayMate Lab and bringing the CS-2000 Spectroradiometer to measure the Spectra and the very dark Black Luminance of the Nexus One. And Special Thanks to Konica Minolta Sensing for loaning us the CS-2000 and sending Jay Catral.